They can from far and wide to pay their last respects to a man they loved. 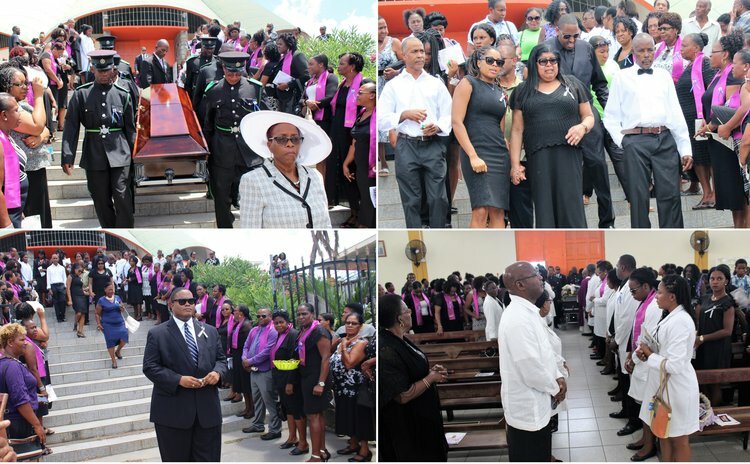 Dr. Phillip Murray St. Jean's funeral service was held at the St. Alphonsus Roman Catholic Church in Pottersville, Goodwill on Saturday 24 March 2018. At the time of his death, Dr. St. Jean was attached to the Roseau Health Centre and on the day he died he was at work and attending to his patients. Dr. St. Jean's funeral service was attended by friends, family and medical professions; former President Eliud Williams and Mrs. Williams also attended. Parish priest of St. Alphonsus, Fr. Charles Martin, was the main celebrant at the funeral mass and former parish priest of that area, Monsignor Eustace Thomas was his concelebrant. In his homily, Fr. Martin described the death of Dr. St. Jean as shocking. "His sudden passing brought shock to all including his patients who had such confidence in him. Words are inadequate to express to his family at his passing. Death is never easy for us to accept no matter how it comes even when we have someone who was sick," Fr. Martin said. He continued: "His passing has brought utter disbelief and shock. We wish that someone would have said to us it is untrue and was a dream and a nightmare. In the world of uncertainly one thing that we can be sure of is death. We all have a strange appointment with death…we all have plans for tomorrow and we don't know what tomorrow will bring so we all have to be ready for death. "You are a mist, a vapor which appears for a little while and disappears. All that reminds us brothers and sisters is that life is a gift from God and is very fragile. We need to live prudent lives, be wise in our judgment s and decision making," the Catholic priest said to the packed church. Using scripture versus, he told the congregation that time was short on earth and life does not belong to anyone. "Dr. St. Jean is one who has added a lot of life to his 58 years. He lived a full life which was unselfish…a life of humility, calm and a pleasant disposition. He was not able to stay angry for too long and always found a way to break the ice," Fr. Martin said. Fr. Martin told the congregation that Dr. St. Jean was "very approachable, kind hearted and went beyond the call of duty... charming with a love for his patients and was unselfish; thanks to God for the lives that he touched. He would not stop being a doctor even when he was not in office. He was a doctor 24/7." After the funeral mass Dr. St. Jean's body was taken to the LaPlaine Catholic cemetery; he was born in LaPlaine.